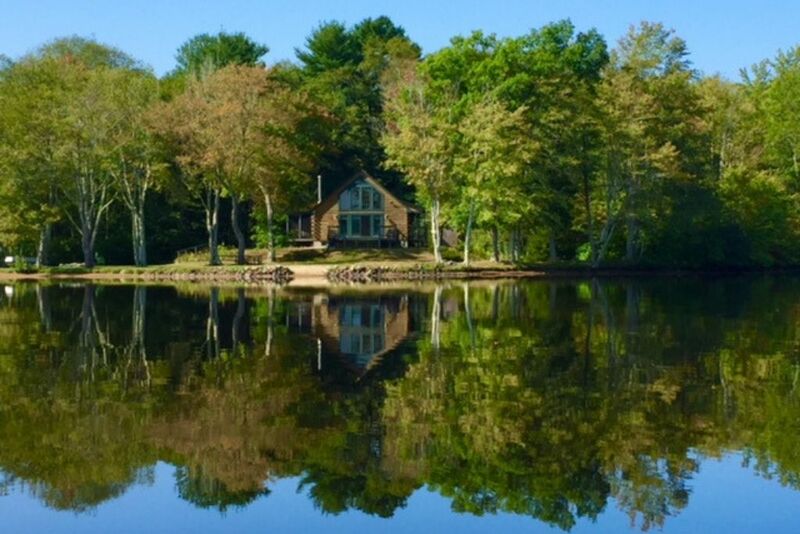 Authentic log cabin on a private 5 acre peninsula with 180 degree views of Pachaug Pond and is located directly on the water. Property has 2 bedrooms (Queen & Full) with a sleeping loft (2 twins) that overlooks the living space and a sweeping view of the pond. During the warmer months there is a screened sleeping porch. Guests can enjoy hours on the pond with canoeing and floating with friends and family. Spend evenings by the fire pit roasting marshmallows and see the moon rise over the pond. There is a hot water outdoor shower too. During the winter, guests can ice fish right in their front yard or hike in the nearby Pachaug Forest! Enjoy nights by the warmth of the Ben Franklin wood stove. There is a full kitchen with dishwasher, laundry, large eating bar and dining area for entertaining. Central heat and air conditioning. Complimentary WIFI available for Netflix, Hulu, and Amazon Prime Accounts. It's a little piece of heaven! The cabin was beautiful and the hosts were super helpful. Secluded, rustic, terrific views of the water and night sky. A lovely respite for the 5 adults we had in our party, but it would be a great spot for a family. Two thumbs up! Awesome, relaxing experience in a beautiful setting. The property was perfect! It was secluded enough to offer the peace and tranquility we we hoping for. I personally was seeking the opportunity to get away from the stress of my everyday life, and too enjoy some down time. I got to experience that, had the opportunity to enjoy a book with ultimate relaxation.